These notes introduce the Oracle server architecture. The architecture includes physical components, memory components, processes, and logical structures. Oracle server: An Oracle server includes an Oracle Instance and an Oracle database. · An Oracle database includes several different types of files: datafiles, control files, redo log files and archive redo log files. The Oracle server also accesses parameter files and password files. · This set of files has several purposes. o One is to enable system users to process SQL statements. o Another is to improve system performance. o Still another is to ensure the database can be recovered if there is a software/hardware failure. · The database server must manage large amounts of data in a multi-user environment. · The server must manage concurrent access to the same data. · The server must deliver high performance. This generally means fast response times. · The first component set is the set of background processes (PMON, SMON, RECO, DBW0, LGWR, CKPT, D000 and others). o These will be covered later in detail – each background process is a computer program. 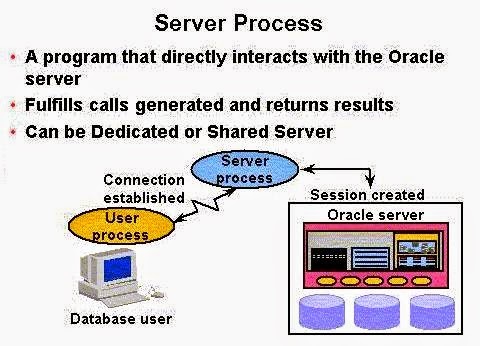 o These processes perform input/output and monitor other Oracle processes to provide good performance and database reliability. · The second component set includes the memory structures that comprise the Oracle instance. o When an instance starts up, a memory structure called the System Global Area (SGA) is allocated. o At this point the background processes also start. · An Oracle Instance provides access to one and only one Oracle database. Oracle database: An Oracle database consists of files. · Sometimes these are referred to as operating system files, but they are actually database files that store the database information that a firm or organization needs in order to operate. · The redo log files are used to recover the database in the event of application program failures, instance failures and other minor failures. 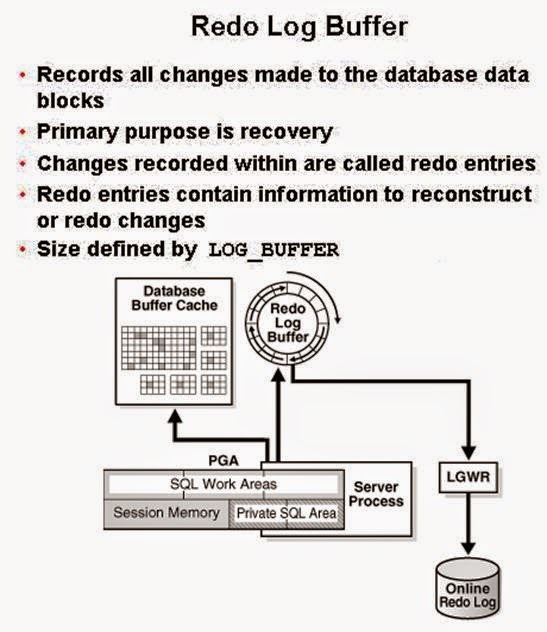 · The archived redo log files are used to recover the database if a disk fails. o The required parameter file that is used to specify parameters for configuring an Oracle instance when it starts up. o The optional password file authenticates special users of the database – these are termed privileged users and include database administrators. o Alert and Trace Log Files – these files store information about errors and actions taken that affect the configuration of the database. User and server processes: The processes shown in the figure are called user and server processes. These processes are used to manage the execution of SQL statements. · A Shared Server Process can share memory and variable processing for multiple user processes. · A Dedicated Server Process manages memory and variables for a single user process. This figure from the Oracle Database Administration Guide provides another way of viewing the SGA. System users can connect to an Oracle database through SQLPlus or through an application program like the Internet Developer Suite (the program becomes the system user). This connection enables users to execute SQL statements. The act of connecting creates a communication pathway between a user process and an Oracle Server. As is shown in the figure above, the User Process communicates with the Oracle Server through a Server Process. The User Process executes on the client computer. The Server Process executes on the server computer, and actually executes SQL statements submitted by the system user. The figure shows a one-to-one correspondence between the User and Server Processes. This is called a Dedicated Server connection. An alternative configuration is to use a Shared Server where more than one User Process shares a Server Process. Sessions: When a user connects to an Oracle server, this is termed a session. The User Global Area is session memory and these memory structures are described later in this document. The session starts when the Oracle server validates the user for connection. The session ends when the user logs out (disconnects) or if the connection terminates abnormally (network failure or client computer failure). A user can typically have more than one concurrent session, e.g., the user may connect using SQLPlus and also connect using Internet Developer Suite tools at the same time. The limit of concurrent session connections is controlled by the DBA. If a system users attempts to connect and the Oracle Server is not running, the system user receives the Oracle Not Available error message. 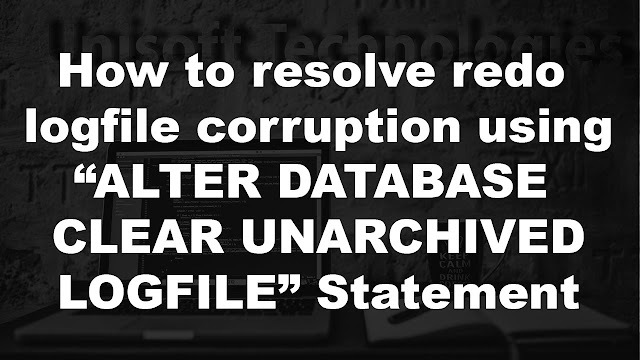 · Datafiles – these contain the organization's actual data. · Redo log files – these contain a chronological record of changes made to the database, and enable recovery when failures occur. · Control files – these are used to synchronize all database activities and are covered in more detail in a later module. · Parameter file – there are two types of parameter files. o The init.ora file (also called the PFILE) is a static parameter file. It contains parameters that specify how the database instance is to start up. For example, some parameters will specify how to allocate memory to the various parts of the system global area. o The spfile.ora is a dynamic parameter file. It also stores parameters to specify how to startup a database; however, its parameters can be modified while the database is running. · Password file – specifies which *special* users are authenticated to startup/shut down an Oracle Instance. · Archived redo log files – these are copies of the redo log files and are necessary for recovery in an online, transaction-processing environment in the event of a disk failure. Memory management - focus is to maintain optimal sizes for memory structures. · Memory is managed based on memory-related initialization parameters. · These values are stored in the init.ora file for each database. o DBA specifies the target size for instance memory. o The database instance automatically tunes to the target memory size. o Database redistributes memory as needed between the SGA and the instance PGA. o This management mode is partially automated. o DBA specifies the target size for the SGA. o DBA can optionally set an aggregate target size for the PGA or managing PGA work areas individually. o Instead of setting the total memory size, the DBA sets many initialization parameters to manage components of the SGA and instance PGA individually. · System Global Area (SGA) – this is allocated when an Oracle Instance starts up. · Program Global Area (PGA) – this is allocated when a Server Process starts up. · User Global Area (UGA) – this is allocated when a user connects to create a session. The SGA is a read/write memory area that stores information shared by all database processes and by all users of the database (sometimes it is called the Shared Global Area). o This information includes both organizational data and control information used by the Oracle Server. 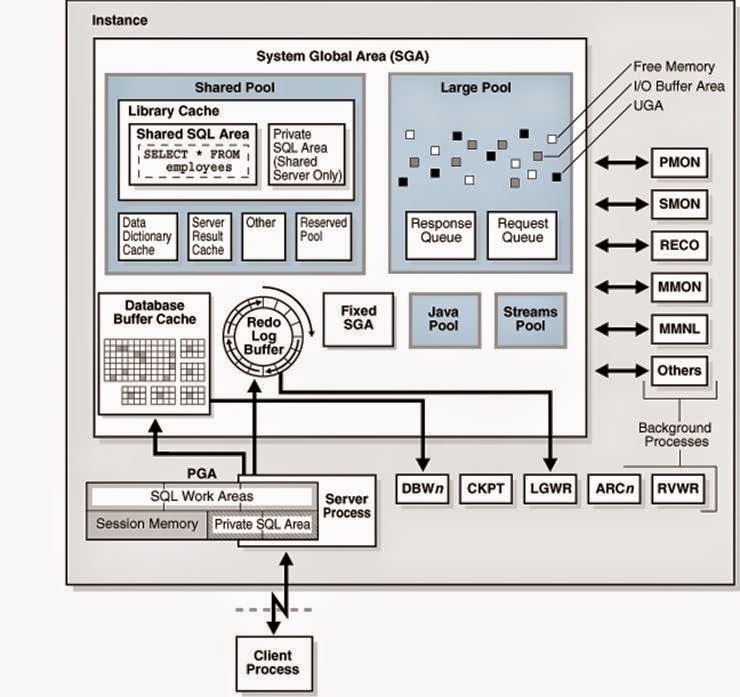 o The SGA is allocated in memory and virtual memory. o The size of the SGA can be established by a DBA by assigning a value to the parameter SGA_MAX_SIZE in the parameter file—this is an optional parameter. The SGA is allocated when an Oracle instance (database) is started up based on values specified in the initialization parameter file (either PFILE or SPFILE). The SHOW SGA SQL command will show you the SGA memory allocations. · This is a recent clip of the SGA for the DBORCL database at SIUE. · In order to execute SHOW SGA you must be connected with the special privilege SYSDBA (which is only available to user accounts that are members of the DBA Linux group). Early versions of Oracle used a Static SGA. This meant that if modifications to memory management were required, the database had to be shutdown, modifications were made to the init.ora parameter file, and then the database had to be restarted. Oracle 11g uses a Dynamic SGA. Memory configurations for the system global area can be made without shutting down the database instance. The DBA can resize the Database Buffer Cache and Shared Pool dynamically. · SGA_MAX_SIZE: This optional parameter is used to set a limit on the amount of virtual memory allocated to the SGA – a typical setting might be 1 GB; however, if the value for SGA_MAX_SIZE in the initialization parameter file or server parameter file is less than the sum the memory allocated for all components, either explicitly in the parameter file or by default, at the time the instance is initialized, then the database ignores the setting for SGA_MAX_SIZE. For optimal performance, the entire SGA should fit in real memory to eliminate paging to/from disk by the operating system. · DB_CACHE_SIZE: This optional parameter is used to tune the amount memory allocated to the Database Buffer Cache in standard database blocks. Block sizes vary among operating systems. The DBORCL database uses 8 KB blocks. The total blocks in the cache defaults to 48 MB on LINUX/UNIX and 52 MB on Windows operating systems. · LOG_BUFFER: This optional parameter specifies the number of bytes allocated for the Redo Log Buffer. · SHARED_POOL_SIZE: This optional parameter specifies the number of bytes of memory allocated to shared SQL and PL/SQL. The default is 16 MB. If the operating system is based on a 64 bit configuration, then the default size is 64 MB. · LARGE_POOL_SIZE: This is an optional memory object – the size of the Large Pool defaults to zero. If the init.ora parameter PARALLEL_AUTOMATIC_TUNING is set to TRUE, then the default size is automatically calculated. · JAVA_POOL_SIZE: This is another optional memory object. The default is 24 MB of memory. The size of the SGA cannot exceed the parameter SGA_MAX_SIZE minus the combination of the size of the additional parameters, DB_CACHE_SIZE, LOG_BUFFER, SHARED_POOL_SIZE, LARGE_POOL_SIZE, and JAVA_POOL_SIZE. · If the SGA is less than 1 GB in total, each granule is 4 MB. · If the SGA is greater than 1 GB in total, each granule is 16 MB. Granules are assigned to the Database Buffer Cache, Shared Pool, Java Pool, and other memory structures, and these memory components can dynamically grow and shrink. Using contiguous memory improves system performance. The actual number of granules assigned to one of these memory components can be determined by querying the database view named V$BUFFER_POOL. Granules are allocated when the Oracle server starts a database instance in order to provide memory addressing space to meet the SGA_MAX_SIZE parameter. The minimum is 3 granules: one each for the fixed SGA, Database Buffer Cache, and Shared Pool. In practice, you'll find the SGA is allocated much more memory than this. The SELECT statement shown below shows a current_size of 1,152 granules. For additional information on the dynamic SGA sizing, enroll in Oracle's Oracle11g Database Performance Tuning course. · a nonshared memory region that contains data and control information exclusively for use by an Oracle process. 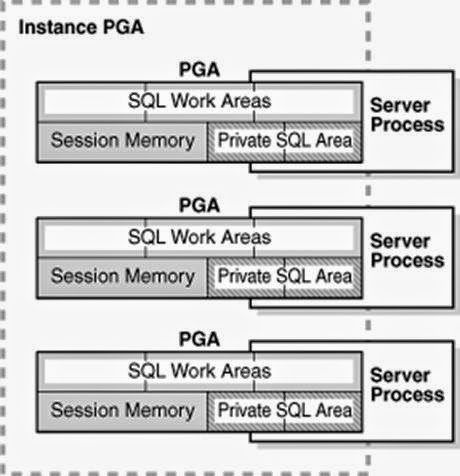 · A PGA is created by Oracle Database when an Oracle process is started. · One PGA exists for each Server Process and each Background Process. It stores data and control information for a single Server Process or a single Background Process. · It is allocated when a process is created and the memory is scavenged by the operating system when the process terminates. This is NOT a shared part of memory – one PGA to each process only. · The collection of individual PGAs is the total instance PGA, or instance PGA. · Database initialization parameters set the size of the instance PGA, not individual PGAs. The Program Global Area is also termed the Process Global Area (PGA) and is a part of memory allocated that is outside of the Oracle Instance. · Private SQL Area: Stores information for a parsed SQL statement – stores bind variable values and runtime memory allocations. A user session issuing SQL statements has a Private SQL Area that may be associated with a Shared SQL Area if the same SQL statement is being executed by more than one system user. This often happens in OLTP environments where many users are executing and using the same application program. o Dedicated Server environment – the Private SQL Area is located in the Program Global Area. o Shared Server environment – the Private SQL Area is located in the System Global Area. · Session Memory: Memory that holds session variables and other session information. · SQL Work Areas: Memory allocated for sort, hash-join, bitmap merge, and bitmap create types of operations. o Oracle 9i and later versions enable automatic sizing of the SQL Work Areas by setting the WORKAREA_SIZE_POLICY = AUTO parameter (this is the default!) and PGA_AGGREGATE_TARGET = n (where n is some amount of memory established by the DBA). However, the DBA can let the Oracle DBMS determine the appropriate amount of memory. Prior to Oracle 10G, a DBA had to manually specify SGA Component sizes through the initialization parameters, such as SHARED_POOL_SIZE, DB_CACHE_SIZE, JAVA_POOL_SIZE, and LARGE_POOL_SIZE parameters. Automatic Shared Memory Management enables a DBA to specify the total SGA memory available through the SGA_TARGET initialization parameter. The Oracle Database automatically distributes this memory among various subcomponents to ensure most effective memory utilization. With automatic SGA memory management, the different SGA components are flexibly sized to adapt to the SGA available. Setting a single parameter simplifies the administration task – the DBA only specifies the amount of SGA memory available to an instance – the DBA can forget about the sizes of individual components. No out of memory errors are generated unless the system has actually run out of memory. No manual tuning effort is needed. If SGA_TARGET is set to a value greater than SGA_MAX_SIZE at startup, then the SGA_MAX_SIZE value is bumped up to accommodate SGA_TARGET. The granule size that is currently being used for the SGA for each component can be viewed in the view V$SGAINFO. The size of each component and the time and type of the last resize operation performed on each component can be viewed in the view V$SGA_DYNAMIC_COMPONENTS. The Shared Pool is a memory structure that is shared by all system users. · It caches various types of program data. For example, the shared pool stores parsed SQL, PL/SQL code, system parameters, and data dictionary information. · The shared pool is involved in almost every operation that occurs in the database. For example, if a user executes a SQL statement, then Oracle Database accesses the shared pool. · It consists of both fixed and variable structures. · The variable component grows and shrinks depending on the demands placed on memory size by system users and application programs. Memory can be allocated to the Shared Pool by the parameter SHARED_POOL_SIZE in the parameter file. The default value of this parameter is 8MB on 32-bit platforms and 64MB on 64-bit platforms. Increasing the value of this parameter increases the amount of memory reserved for the shared pool. You can alter the size of the shared pool dynamically with the ALTER SYSTEM SET command. An example command is shown in the figure below. You must keep in mind that the total memory allocated to the SGA is set by the SGA_TARGET parameter (and may also be limited by the SGA_MAX_SIZE if it is set), and since the Shared Pool is part of the SGA, you cannot exceed the maximum size of the SGA. It is recommended to let Oracle optimize the Shared Pool size. The Shared Pool stores the most recently executed SQL statements and used data definitions. This is because some system users and application programs will tend to execute the same SQL statements often. Saving this information in memory can improve system performance. 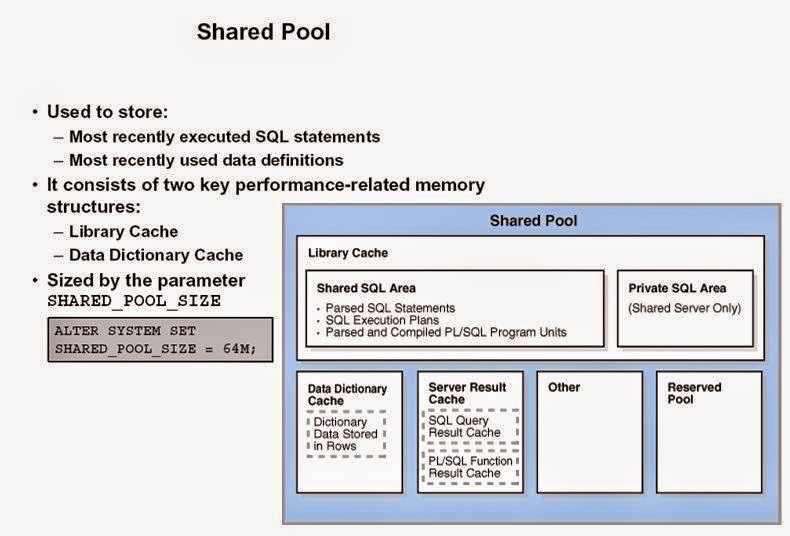 The Shared Pool includes several cache areas described below. Memory is allocated to the Library Cache whenever an SQL statement is parsed or a program unit is called. This enables storage of the most recently used SQL and PL/SQL statements. If the Library Cache is too small, the Library Cache must purge statement definitions in order to have space to load new SQL and PL/SQL statements. Actual management of this memory structure is through a Least-Recently-Used (LRU) algorithm. This means that the SQL and PL/SQL statements that are oldest and least recently used are purged when more storage space is needed. · Shared SQL: This stores/shares the execution plan and parse tree for SQL statements, as well as PL/SQL statements such as functions, packages, and triggers. If a system user executes an identical statement, then the statement does not have to be parsed again in order to execute the statement. · Private SQL Area: With a shared server, each session issuing a SQL statement has a private SQL area in its PGA. o Each user that submits the same statement has a private SQL area pointing to the same shared SQL area. o Many private SQL areas in separate PGAs can be associated with the same shared SQL area. o This figure depicts two different client processes issuing the same SQL statement – the parsed solution is already in the Shared SQL Area. The Data Dictionary Cache is a memory structure that caches data dictionary information that has been recently used. · This cache is necessary because the data dictionary is accessed so often. · Information accessed includes user account information, datafile names, table descriptions, user privileges, and other information. The database server manages the size of the Data Dictionary Cache internally and the size depends on the size of the Shared Pool in which the Data Dictionary Cache resides. If the size is too small, then the data dictionary tables that reside on disk must be queried often for information and this will slow down performance. The Server Result Cache holds result sets and not data blocks. The server result cache contains the SQL query result cache and PL/SQL function result cache, which share the same infrastructure. This cache stores the results of queries and query fragments. · Using the cache results for future queries tends to improve performance. · For example, suppose an application runs the same SELECT statement repeatedly. If the results are cached, then the database returns them immediately. · In this way, the database avoids the expensive operation of rereading blocks and recomputing results. The PL/SQL Function Result Cache stores function result sets. · Without caching, 1000 calls of a function at 1 second per call would take 1000 seconds. · With caching, 1000 function calls with the same inputs could take 1 second total. · Good candidates for result caching are frequently invoked functions that depend on relatively static data. · PL/SQL function code can specify that results be cached. A number of buffer caches are maintained in memory in order to improve system response time. 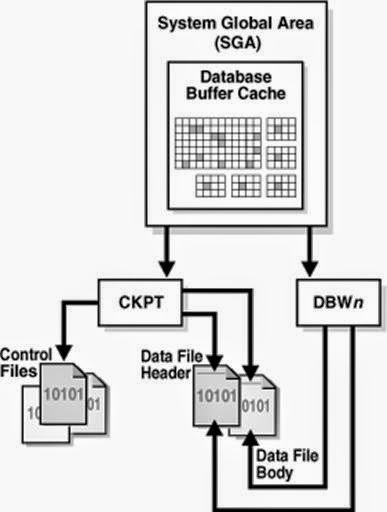 The Database Buffer Cache is a fairly large memory object that stores the actual data blocks that are retrieved from datafiles by system queries and other data manipulation language commands. The purpose is to optimize physical input/output of data. When Database Smart Flash Cache (flash cache) is enabled, part of the buffer cache can reside in the flash cache. · This buffer cache extension is stored on a flash disk device, which is a solid state storage device that uses flash memory. · The database can improve performance by caching buffers in flash memory instead of reading from magnetic disk. · Database Smart Flash Cache is available only in Solaris and Oracle Enterprise Linux. A query causes a Server Process to look for data. · The first look is in the Database Buffer Cache to determine if the requested information happens to already be located in memory – thus the information would not need to be retrieved from disk and this would speed up performance. · If the information is not in the Database Buffer Cache, the Server Process retrieves the information from disk and stores it to the cache. · Keep in mind that information read from disk is read a block at a time, NOT a row at a time, because a database block is the smallest addressable storage space on disk. Database blocks are kept in the Database Buffer Cache according to a Least Recently Used (LRU) algorithm and are aged out of memory if a buffer cache block is not used in order to provide space for the insertion of newly needed database blocks. · Unused - a buffer is available for use - it has never been used or is currently unused. · Clean - a buffer that was used earlier - the data has been written to disk. · Dirty - a buffer that has modified data that has not been written to disk. · Pinned - a buffer is pinned so it does not age out of memory. · the least recently used (LRU) list. The write list (also called a write queue) holds dirty buffers – these are buffers that hold that data that has been modified, but the blocks have not been written back to disk. The LRU list holds unused, free clean buffers, pinned buffers, and free dirty buffers that have not yet been moved to the write list. Free clean buffers do not contain any useful data and are available for use. Pinned buffers are currently being accessed. When an Oracle process accesses a buffer, the process moves the buffer to the most recently used (MRU) end of the LRU list – this causes dirty buffers to age toward the LRU end of the LRU list. 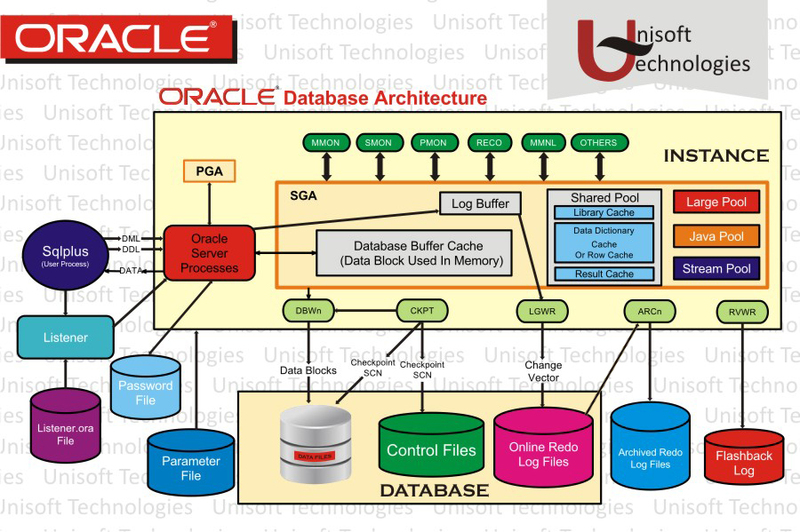 When an Oracle user process needs a data row, it searches for the data in the database buffer cache because memory can be searched more quickly than hard disk can be accessed. If the data row is already in the cache (a cache hit), the process reads the data from memory; otherwise a cache miss occurs and data must be read from hard disk into the database buffer cache. Before reading a data block into the cache, the process must first find a free buffer. The process searches the LRU list, starting at the LRU end of the list. The search continues until a free buffer is found or until the search reaches the threshold limit of buffers. Each time a user process finds a dirty buffer as it searches the LRU, that buffer is moved to the write list and the search for a free buffer continues. When a user process finds a free buffer, it reads the data block from disk into the buffer and moves the buffer to the MRU end of the LRU list. If an Oracle user process searches the threshold limit of buffers without finding a free buffer, the process stops searching the LRU list and signals the DBWn background process to write some of the dirty buffers to disk. This frees up some buffers. The Redo Log Buffer memory object stores images of all changes made to database blocks. · Database blocks typically store several table rows of organizational data. This means that if a single column value from one row in a block is changed, the block image is stored. Changes include INSERT, UPDATE, DELETE, CREATE, ALTER, or DROP. · LGWR writes redo sequentially to disk while DBWn performs scattered writes of data blocks to disk. o Scattered writes tend to be much slower than sequential writes. o Because LGWR enable users to avoid waiting for DBWn to complete its slow writes, the database delivers better performance. The Redo Log Buffer as a circular buffer that is reused over and over. As the buffer fills up, copies of the images are stored to the Redo Log Files that are covered in more detail in a later module. · Allocating space for session memory requirements from the User Global Area where a Shared Server is in use. · Transactions that interact with more than one database, e.g., a distributed database scenario. · Backup and restore operations by the Recovery Manager (RMAN) process. o RMAN uses this only if the BACKUP_DISK_IO = n and BACKUP_TAPE_IO_SLAVE = TRUE parameters are set. o If the Large Pool is too small, memory allocation for backup will fail and memory will be allocated from the Shared Pool. · Parallel execution message buffers for parallel server operations. The PARALLEL_AUTOMATIC_TUNING = TRUE parameter must be set. The Large Pool size is set with the LARGE_POOL_SIZE parameter – this is not a dynamic parameter. It does not use an LRU list to manage memory. The Java Pool is an optional memory object, but is required if the database has Oracle Java installed and in use for Oracle JVM (Java Virtual Machine). · The size is set with the JAVA_POOL_SIZE parameter that defaults to 24MB. · The Java Pool is used for memory allocation to parse Java commands and to store data associated with Java commands. · Storing Java code and data in the Java Pool is analogous to SQL and PL/SQL code cached in the Shared Pool. This pool stores data and control structures to support the Oracle Streams feature of Oracle Enterprise Edition. · Oracle Steams manages sharing of data and events in a distributed environment. · It is sized with the parameter STREAMS_POOL_SIZE. · If STEAMS_POOL_SIZE is not set or is zero, the size of the pool grows dynamically. 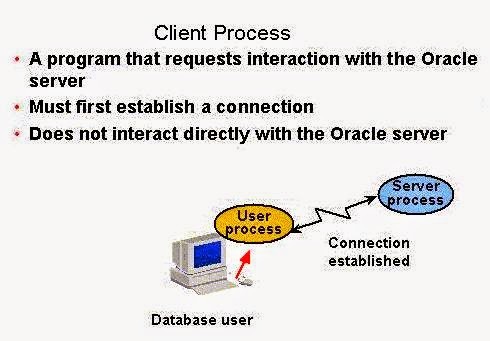 · User Process: Starts when a database user requests to connect to an Oracle Server. · Server Process: Establishes the Connection to an Oracle Instance when a User Process requests connection – makes the connection for the User Process. · Background Processes: These start when an Oracle Instance is started up. In order to use Oracle, you must connect to the database. This must occur whether you're using SQLPlus, an Oracle tool such as Designer or Forms, or an application program. The client process is also termed the user process in some Oracle documentation. A Server Process is the go-between for a Client Process and the Oracle Instance. · Dedicated Server environment – there is a single Server Process to serve each Client Process. · Shared Server environment – a Server Process can serve several User Processes, although with some performance reduction. · Allocation of server process in a dedicated environment versus a shared environment is covered in further detail in the Oracle11g Database Performance Tuning course offered by Oracle Education. 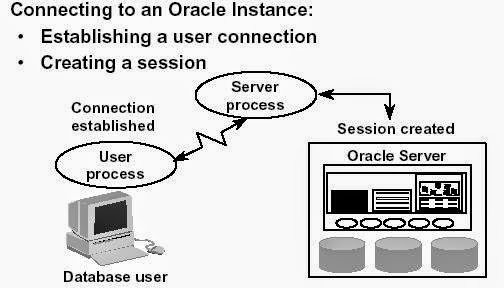 As is shown here, there are both mandatory, optional, and slave background processes that are started whenever an Oracle Instance starts up. These background processes serve all system users. We will cover mandatory process in detail. The Process Monitor (PMON) monitors other background processes. It is a cleanup type of process that cleans up after failed processes. Examples include the dropping of a user connection due to a network failure or the abnormal termination (ABEND) of a user application program. It cleans up the database buffer cache and releases resources that were used by a failed user process. It does the tasks shown in the figure below. The System Monitor (SMON) does system-level cleanup duties. It is responsible for instance recovery by applying entries in the online redo log files to the datafiles. Other processes can call SMON when it is needed. It also performs other activities as outlined in the figure shown below. Rolls forward to recover data that was recorded in a Redo Log File, but that had not yet been recorded to a datafile by DBWn. SMON reads the Redo Log Files and applies the changes to the data blocks. This recovers all transactions that were committed because these were written to the Redo Log Files prior to system failure. Opens the database to allow system users to logon. SMON also does limited space management. It combines (coalesces) adjacent areas of free space in the database's datafiles for tablespaces that are dictionary managed. It also deallocates temporary segments to create free space in the datafiles. The Database Writer writes modified blocks from the database buffer cache to the datafiles. One database writer process (DBW0) is sufficient for most systems. A DBA can configure up to 20 DBWn processes (DBW0 through DBW9 and DBWa through DBWj) in order to improve write performance for a system that modifies data heavily. The purpose of DBWn is to improve system performance by caching writes of database blocks from the Database Buffer Cache back to datafiles. Blocks that have been modified and that need to be written back to disk are termed "dirty blocks." Performance improves because by delaying writing changed database blocks back to disk, a Server Process may find the data that is needed to meet a User Process request already residing in memory! DBWn writes to datafiles when one of these events occurs that is illustrated in the figure below. The Log Writer (LGWR) writes contents from the Redo Log Buffer to the Redo Log File that is in use. These are sequential writes since the Redo Log Files record database modifications based on the actual time that the modification takes place. LGWR actually writes before the DBWn writes and only confirms that a COMMIT operation has succeeded when the Redo Log Buffer contents are successfully written to disk. LGWR can also call the DBWn to write contents of the Database Buffer Cache to disk. The LGWR writes according to the events illustrated in the figure shown below. The Checkpoint (CPT) process writes information to update the database control files and headers of datafiles. A checkpoint identifies a point in time with regard to the Redo Log Files where instance recovery is to begin should it be necessary. It can tell DBWn to write blocks to disk. A checkpoint is taken at a minimum, once every three seconds. Ensures modified data blocks in memory are regularly written to disk – CKPT can call the DBWn process in order to ensure this and does so when writing a checkpoint record. Reduces Instance Recovery time by minimizing the amount of work needed for recovery since only Redo Log File entries processed since the last checkpoint require recovery. Causes all committed data to be written to datafiles during database shutdown. All right reserved to their respective authors and blog writer on the internet. Images from Oracle EKits and reference manual.